I am super excited to be heading back to Galax, VA to teach at the Chestnut Creek School of the Arts, March 10th and 11th. I love trekking to this small southwestern Virginia city known for it's furniture and it's blue grass music. In part, I love where I get to stay - a little cabin minutes from the downtown area, but I love the people. The class at the school have been small, but they've been filled with such awesome folks. I can't believe that it's just two and a half weeks away! Better sign up now! 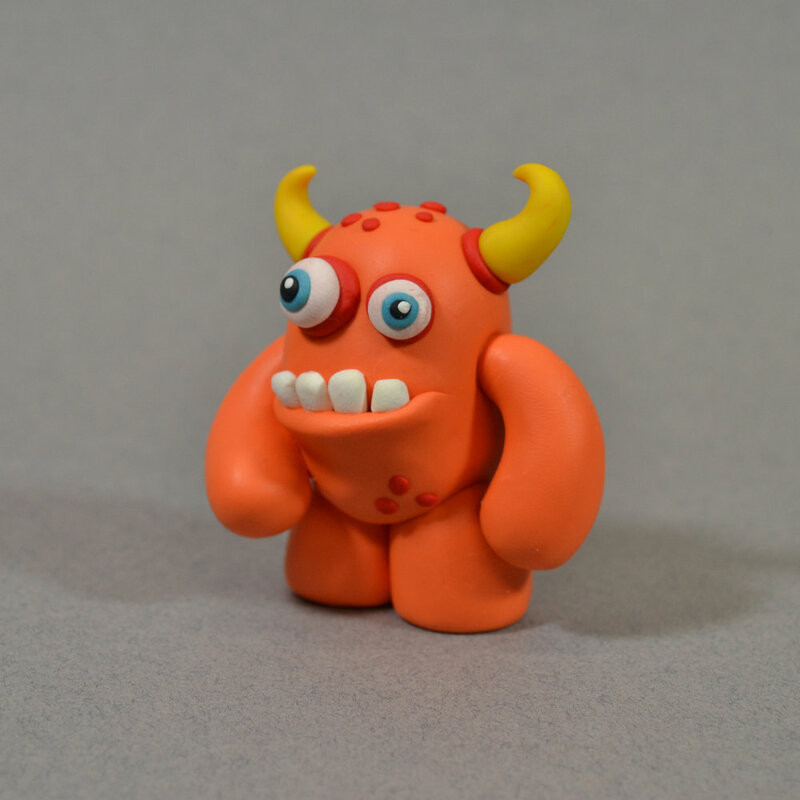 On Saturday, March 10th, I'll be teaching my Monster Maker Workshop as an all-day class. I just taught this at Art and Soul Portland as a three hour evening class, and everyone had so much fun. I can't wait to teach it as a six hour class. I'll be bringing my oven so that we can create polymer clay as well as shrink art creations, along with drawing, painting, and collage. Come on out and spend the day making monsters with me. On Sunday, March 11th, I'll be teaching my Artful Layers class as another all-day workshop. 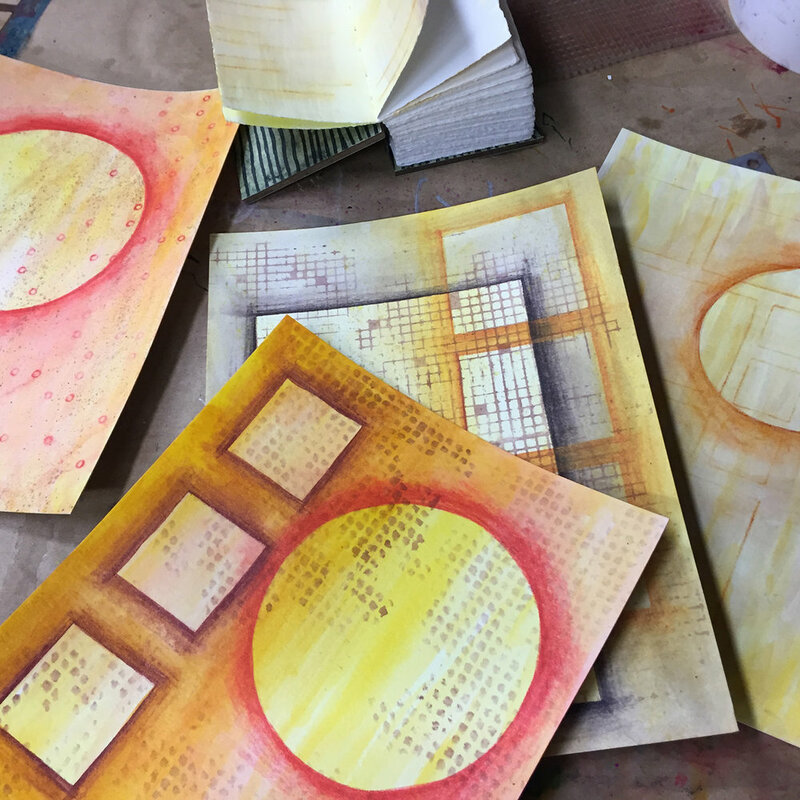 We'll be exploring the layering of mixed media including watercolor, collage, ink, watercolor pencil, and much more. I recently taught this to a full class at the Round Hill Arts Center, and we had a grand time painting, drawing, and collaging. Come on out and may a solid creative mess with me. I'd love to see you in Galax, VA for one or both of my workshops! I recently finished these four little guys, and I think that I am finally figuring out a baking procedure that is reducing the cracking. They are all looking for nice comfortable homes, so please check out the shop to take a closer look. You know you want one for yourself! Another monster ink drawing. I have started adding watercolor to a few in this series, and I'll share more later. But in the meantime I wanted to offer a resource. Someone on Facebook had suggested that these guys would make for a great coloring book, and hey, if you want to print them out and color them, then be my guest. BUT, what if you made your own monster? That's even more creative and meaningful. So, I'm sharing a link to my Monster Maker PDF. This is a simple resource that I put together for my students to use. Feel free to download it, and use it to make your own monster, and go on over to Facebook, and share! Happy monster making! I must say that my fascination with monsters has turned into a full-blown obsession. I've made a few more polymer clay sculptures (that I still need to bake), and I've been sketching and drawing even more. I started on a series of 6"x9" drawings on Strathmore 400 Mixed Media Paper. I began with a quick sketch in pencil, and then inked it with my Faber Castell Pitt Pens. My plan is to add watercolor paint to them, but I don't know if I'll be deliberate with the color or a bit more free. Since the Pitt Pens are india ink and waterproof, I'm hoping that I can paint over the lines without any bleeding and smearing. Above is one of the first monsters in this series. I'll share more later. Well my first attempts at polymer clay monsters this weekend weren't as successful as I would have liked. Although I've done a lot with ceramic clay and Model Magic over the years, I have never used polymer clay, and it does have a bit of a learning curve. First of all, it took a while to get use to the clay. I first tried Sculpey III, but I felt like it was a little too soft, so I tried Premo Sculpey, and Fimo. Each of these has their own issues, but after a while I began to catch onto the clay, and feel like my later attempts were more successful as I figured out how to best use the clay. Then there's my attempt at baking the clay. My first attempt at baking ended in three of the four pieces cracking - one had only a slight crack, but the other two had significant cracks. Only the purple guy above survived. But after following some advice someone gave me on Facebook (Thanks, Glaucia), I was more successful. I ended up with six that survived out of ten. I'm thinking that my success rate will go up as I make more. Depending on how many more I make, I might have to put some for sale on the website. I'll share more of the monsters over the next few days.